So often, we see clever kids who adore camp and extracurricular activities, but just don't feel the same way about school. He or she may have a hidden vision problem that impacts learning, called Convergence Insufficiency (CI). CI is a near vision problem that impacts your capacity to see things at close distances. This means, a person with CI would have trouble reading, writing and working on things, even when it's something sitting right on the desk in front of them. A person with CI has a hard time, or is simply not able to coordinate his or her eyes at close distances, which makes necessary tasks, like reading, very difficult. And to prevent subsequent double vision, they make an effort to make their eyes converge, or turn back in. This additional strain can often cause a number of prohibitive side effects including headaches from eye strain, blurred vision, double vision, tiredness and decreased concentration, and the inability to comprehend during relatively brief reading periods. With bad instances of CI, the eyes will turn outwards. This is called strabismus. You may have also noticed that your child often loses the place in a book, tends to shut one eye to better see, has trouble remembering what was read, or describes how the words they look at appear to move, jump, swim or float. And if your son or daughter is tired or overworked, it's common for their symptoms to become worse. CI is frequently misdiagnosed as ADD or ADHD, dyslexia, or an anxiety disorder. Additionally, this condition is easily missed when a child gets a simple eye exam using only an eye chart. Your child may have 20/20 eyesight, but also have CI, and the subsequent difficulties associated with reading. Despite all this, the fact is that CI can be expected to respond positively to treatment. 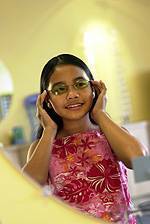 Treatments generally involve vision therapy performed by an eye care professional with reinforcing practice sessions at home, or the use of prism glasses, which can minimize some symptoms. The unfortunate news is that because of persistent lack of testing for CI, many sufferers aren't getting the treatment they need early in life. So if your child is battling to read and concentrate, speak to us to discuss having that loved one tested for CI.